Check out our recent work! Our Article Issued on APTA’s CEU Study Courses! 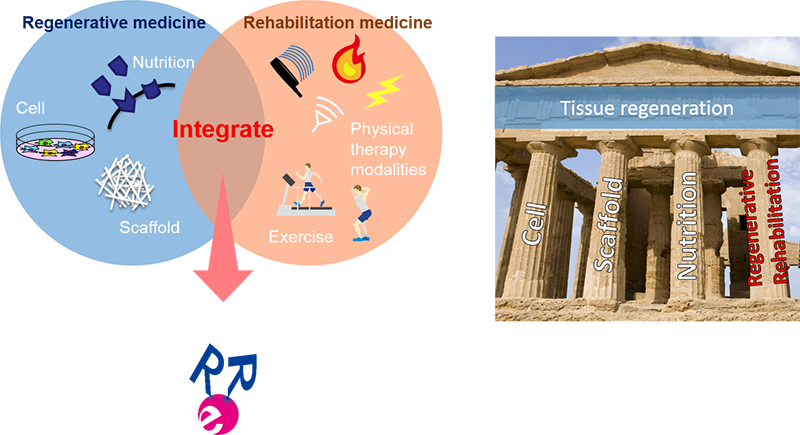 Regenerative Rehabilitation is the integration of principles and approaches from rehabilitation and regenerative medicine with the ultimate goal of developing innovative and effective methods that promote the restoration of function through tissue regeneration and repair. We are a research group impelling the regenerative rehabilitation research in Japan. Regenerative medicine is rapidly emerging, and therefore, the development of related rehabilitation methodology is strongly needed. Even though its importance is considered, neither accumulation of fundamental knowledge nor establishment of systematic theory to implement the appropriate rehabilitation for the regenerative medicine has been underway. Our purpose is to cure people of their difficult diseases and return them to their society, as authenticating the evidences of the regenerative medicine related rehabilitation (Regenerative Rehabilitation) so that its safeness, efficacy, and economy could be improved. Now we make an effort on fundamental researches to apply clinical setting, and take a role in the international development of the regenerative rehabilitation as a member of the Regenerative Rehabilitation Consortium Leadership Council. As for the domestic, we build up and develop the fundamental conception for those who need regenerative medicine through liberal discussions in various forms of meetings in accordance with energetic researchers and practitioners. We keep the liberal atmosphere that everyone there can speak up no matter what position or field you are in. We keep moving to the situation forward. To do this, we take full advantage of new approaches such as SNS to link between people, beyond the traditional boundaries. Our concept shall expand by linking those who share our foresight. If you are interested in our activities, please feel free to contact us! Our E-mail address and Facebook URL are following. we will provide members with following education. Fundamental knowledge of the cell biology and mechanobiology. We are recruiting students and trainees from diverse backgrounds who want careers as leaders of the next generation in the Regenerative Rehabilitation. Potential members are required to be deemed acceptable to the Graduate program (Master’s or Doctoral) in the Rehabilitation Sciences, Department of Human Health Sciences, Faculty of Medicine, Kyoto University. Besides, joining as research students (prospective students) is another possibility. Anyone who considers the graduate admission or research student, or those who are just interested, please contact us. We will advise about admission, researches, life in Japan, etc. Also, we will give a tour of our laboratory. For more inquiries about the admission, please refer HERE.